Let me start off by stating that I, did not build this model. This also shows off another of my “man caves” my so called “back house”. I use this for working on large models and many other home projects. also it is used for storage. That said, here is the story. I went to a local hardware store and saw an elderly man getting out of his car. 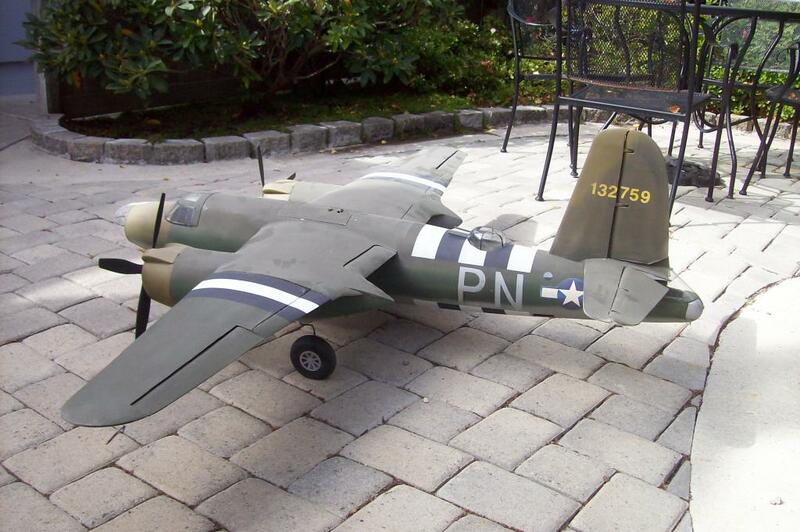 On his bumper was a sticker that stated “I survived the B-26 Marauder”. I had to ask so I made contact with the gentleman to find out about his bumper sticker. 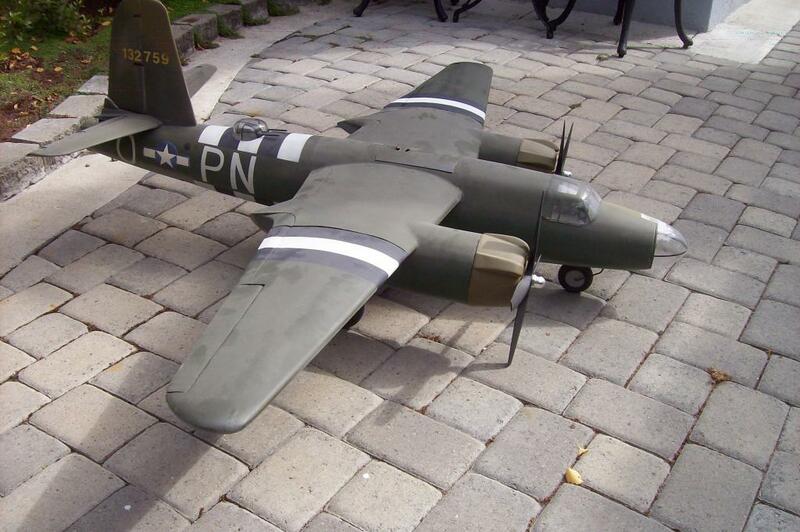 We had a very nice chat and he said he would mail me a DVD concerning the B-26. When I got it it was a compilation of 8mm movies that he had taken from the day he reported to the USAAF. He told me he wanted it back and asked that I mail it back to him. after watching it I returned it to him personally at his home. There, we talked for hours. It turns out that he was a retired engineer and quite an accomplished radio control modeler. He was also with the 449th BS/ 322 BG. He was the operations officer of that group. 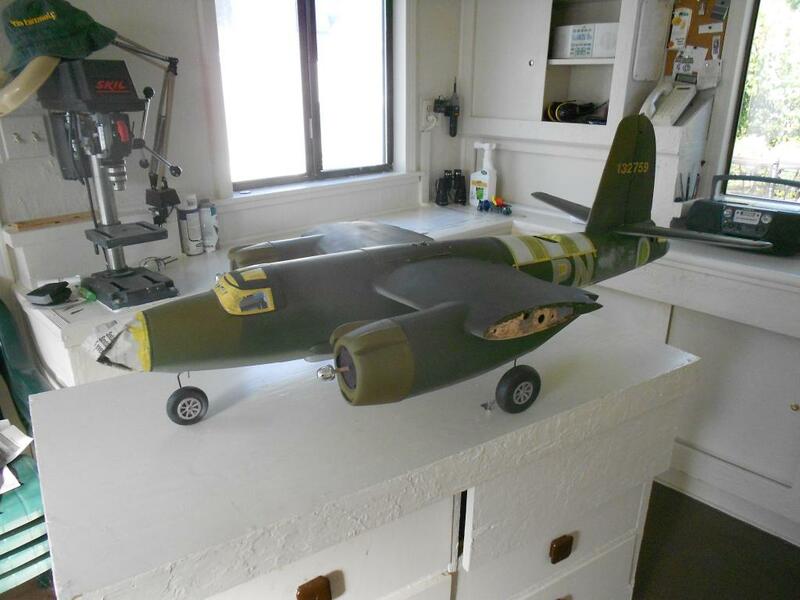 He showed me photos of this B-26 that he had built during it’s construction. He told me that it was hanging in the Hiller Museum in San Carlos, CA. He said he had it painted by some other person and he was never happy with the way it turned out. He asked me if I would be interested in re-painting it for him and I agreed. He was only interested in a generic scheme “just so it looks better than it now does” I told him I would be happy to do it and took it home to my “back house” model cave. I have no idea of the scale of the model. 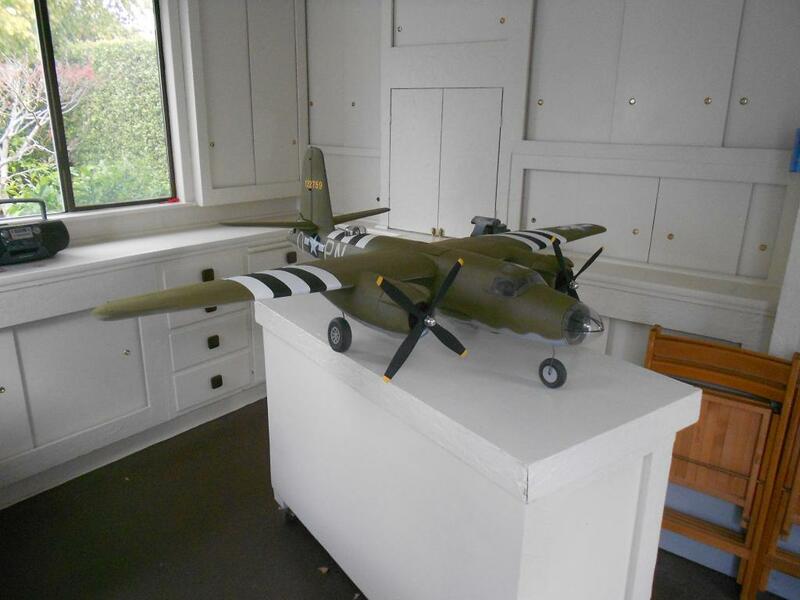 He build it but never installed engines and of course never flew it. 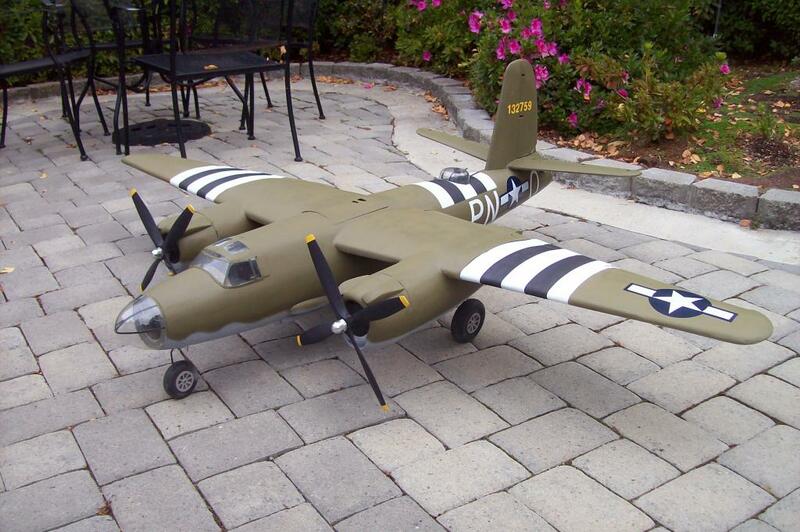 It was constructed with all the servos for flight and also had the basic’s for retractable landing gear. After I re-painted it it was returned to the HIller Museum where it is now. 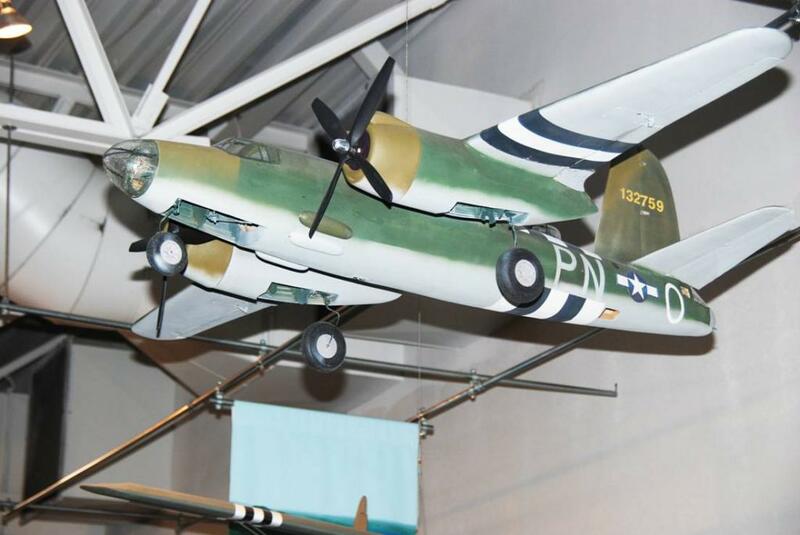 The re-paint is generic but the “PN” is valid for the 449th BS. What’s the wingspan, Frank? Looks to be about five or six feet. 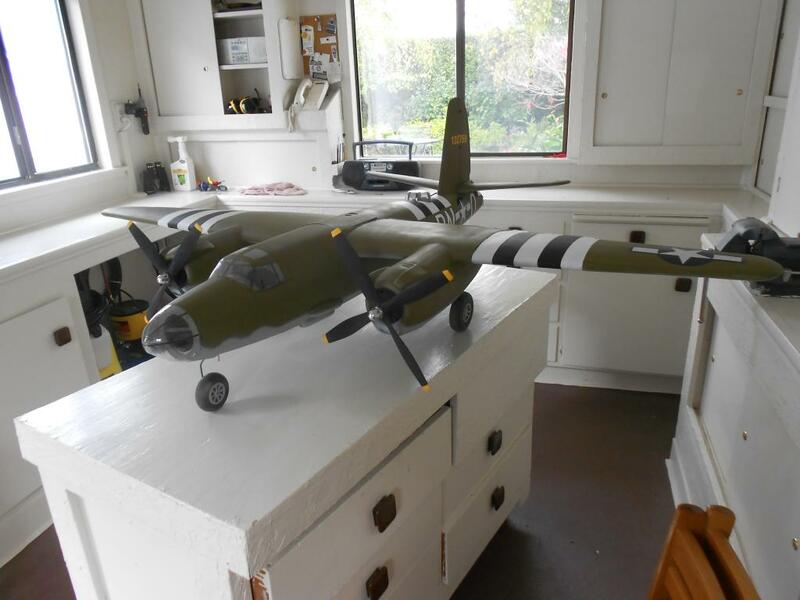 I did an F7F Tigercat for a friend a few years ago that was 83 inches in span and came out to about 1/7 scale if I remember correctly. That would make that model roughly 1/8 scale. 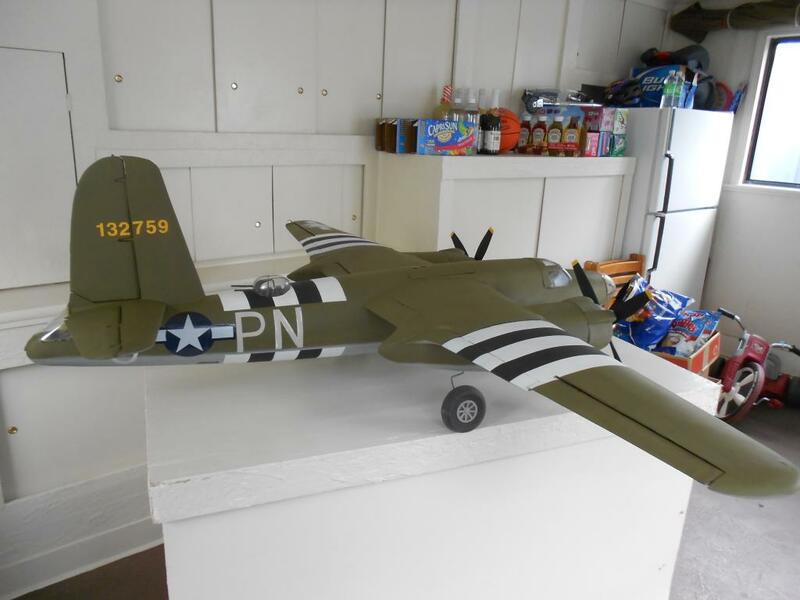 It’s probably scratchbuilt from plans, as I can’t think of anyone who kits a B-26 Marauder (though you can find B-26 Invaders…). That’s a shame, too, as she’s another of my favorites. Great story, and a great deal of respect for a WWII veteran. Your paint job is a nice improvement over the previous color scheme. And if that is your work shop, you lucky man! You should see the bunker I work in….